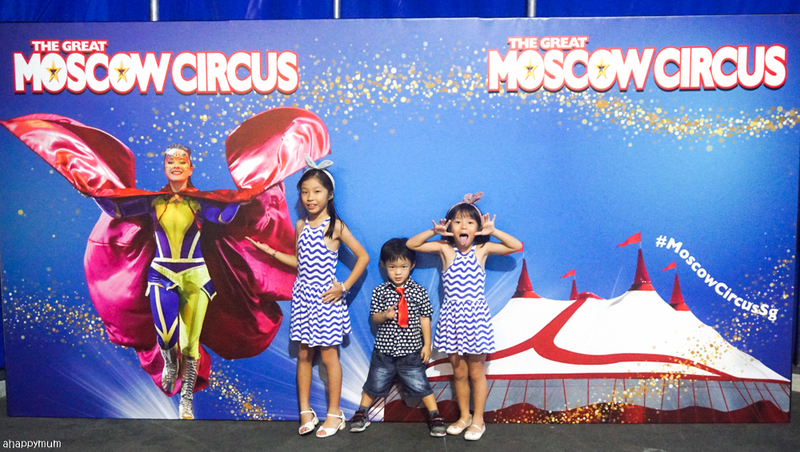 The Great Moscow Circus is in town! 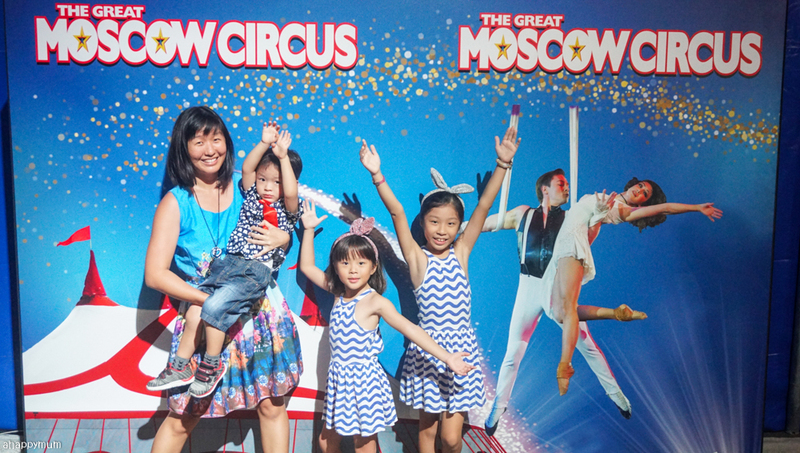 We watched The Great Moscow Circus, which returns to Singapore for the first time in over a decade, under the Big Top tent at the gala premiere on Friday night and let's just say I never expected myself to get such an adrenaline rush from it. But I did and believe it or not, I can still feel those heart pounding moments and can't help but wonder "How do these guys even do such a thing like that?!" Featuring more than 16 spectacular acts and 45 circus superstars from Russia and circus capitals of the world, audiences will be in for a treat as they witness the jaw-dropping acts, be tickled by hilarious antics and be entertained in a way they've never been before. 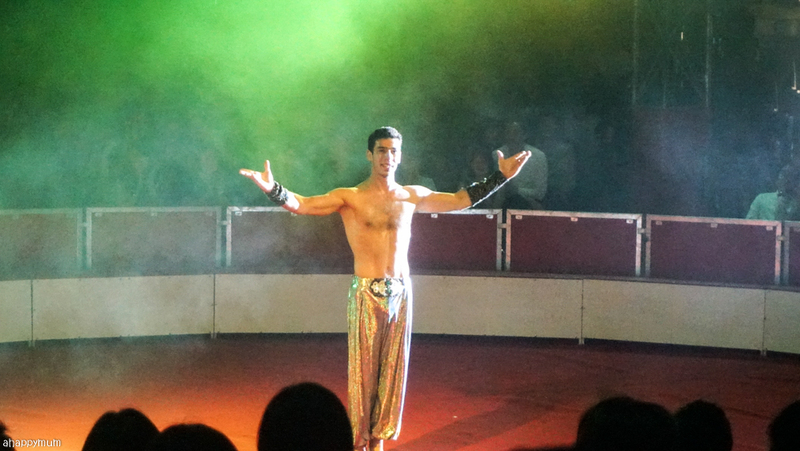 This might be our first circus show as a family of five but we've been to a few before, including our first one in Sweden when we only had one kid, so we were looking forward to that kind of intimate one-ring circus environment with a traditional European ambience that makes you feel at ease and be able to sit back and relax. 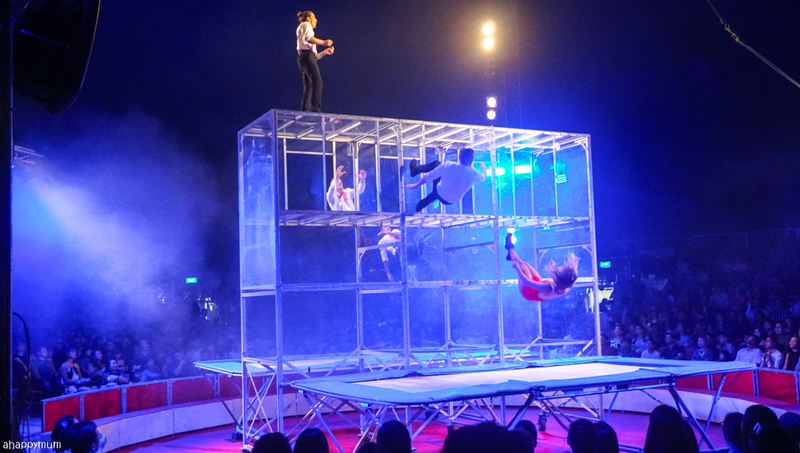 The Great Moscow Circus delivered that and more, starting from the million-dollar Big Top tent that has been specially commissioned for the show in Singapore and took over months to build. With a 40-metre circumference, it means no member of the audience will ever be more than 11 metres away from stage and regardless of where you are seated, you are guaranteed to be able to catch a good view of the acts. To prove if this is true, instead of showing you the official photos and videos that I can lay my hands on from the organisers, I'm instead going to use purely the photos and videos I took from where we were seated at the side. Just so you know, I am not a good photographer and I don't have a DSLR. In my view, I definitely think that the show is worth watching, and even re-watching, because of the immense excitement we had and priceless memories we took away, but first, let's take a look at how it went and why the kids and I are so madly in love with this show. Our show was the 7:30pm one which started promptly at 7:45pm when the majority of the audience was seated. We arrived a little earlier in the hope of trying to get some pictures and I was pleasantly surprised to see that there were four different walls that you could choose from for photo opportunities. This, coupled with the fact that the Big Top only seats 1,600 people per show, made it possible for everyone to take some nice shots without having to queue up much. Check out the seating plan below. 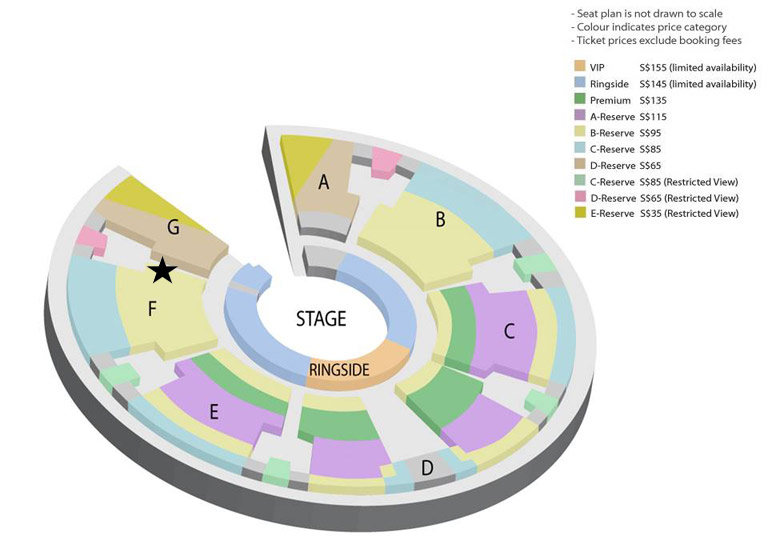 You can choose from VIP, Ringside, Premium, or A-Reserve, B-Reserve, C-Reserve seats, D-Reserve or E-Reserve seats. The last three come with restricted view seats which I would not recommend because you might miss out on some of the action. We were seated at Section F, Row D seats 14-17 (spot the star!) which falls under the B-Reserve section. Now, if you were going for a concert at the stadium which seats 50,000 people and you are at our location, it would appear that this was not optimal as you would be having a side view of the stage and not the centre for the entire show. Sure, I admit that for most of the acts, the performers would be facing the centre seats and if you wish to have the best front view and be able to see their smiles and let them face you during their final poses, the VIP and Premium seats are your safest bet. The ringside seats come in rows of three and these are on level ground, whereas those behind are elevated and tiered to enable you to get a good view of the stage. Since this is a one-ring stage and like I've mentioned, it's an intimate environment with a nice capacity that doesn't make it feel overcrowded, I was pleasantly surprised to learn that we were quite close to the stage in our B-Reserve seats and in any case, the performers tend to make use of the full stage and would more often than not, be moving around in circles in order to engage the entire audience. So if you are looking for some affordable family fun and don't wish to spend a bomb, I do think it is okay to go for the B-Reserve or even C-Reserve seats which are just behind us. Anything beyond that, I guess you would be compromising the views much more. Let the show begin! For the first act, it was the trampoline wall which totally amazed my kids because they love jumping on trampolines but never imagined that it would be possible to do stunts like these - flips, somersaults and even splits. I loved the fast paced music and the endless energy the performers exuded, which made this a perfect first act because it helped to get everyone into an upbeat, positive mood and couldn't help but look forward to seeing what came next. This was something that freaked me out a little because the things he did were simply insane! Yup, here is the most amazing human contortionist who - listen to this - arrived onto the stage in a small, rectangular clear BOX. Gosh, they literally pushed him in on a cart and when they unveiled the cloth to reveal the box to the audience, I felt my jaw drop and said to my kids "There's a person inside. See, those are his feet!". He subsequently showed us how he can do the impossible like making ripples on his abdominal wall as if it could flow like a river, making his shoulder blades jut out such that he had humps on his back, and folding his arms and legs as if there weren't any bones in them. Yup, I knew I gasped quite a few times and was wondering if the kids would be scared but it turned out they were more amused and amazed than anything. Phew! One of my favourite acts from the first half of the show was the Wheel of Death! To be frank, I've already seen this being performed in front of my eyes at least twice. Yet, somehow there was something different about it this time because firstly, I was seated much nearer to the action. Secondly, the four guys just made everything seem so effortless and easy. Last but not least, they were all smiles and they truly enjoyed performing for us - which makes you want to hold your breath for them every time they take up a challenge, like jumping high up on the wheel and even wearing a hood while they do it, and cheer for them every time they achieve a feat. 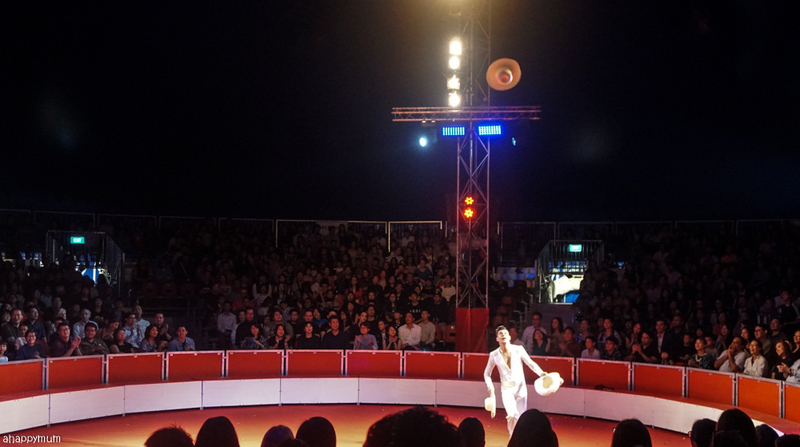 The highlight came when the ringmaster Stas announced that for the first time in Singapore, we were going to witness a somersault being done on the Wheel of Death. Gosh, it can't get more thrilling that that, can it? I stopped breathing for a little while as I was so worried for these guys even though they seemed to have it all under control. I was pretty sure I heard many gasps from the audience too and I knew everyone's heart was pounding as fast as mine. You can see that amazing somersault on my IG highlights as well as many other amazing acts too! There was a 20 minute interval in between which allows you to go for a stretch, go to the loo or just grab some snacks from the kiosks. Be prepared that they are a little pricey though, soft drinks cost $5 each and the cotton candy was at a whopping $8 (too bad for my girl). You can also get some star or heart wands which can light up the night and these come in different sizes and prices range from $10 - $20. Note that you won't be able to find much food in the circus (other than popcorn, nuts and candy floss) and no outside food is allowed, so do get a good meal before you enter. We had ours at the food court - 1983 A Taste of Nanyang - located in MBS which is right beside and you just need to take an escalator down one level. Now, let's move on to the second half! 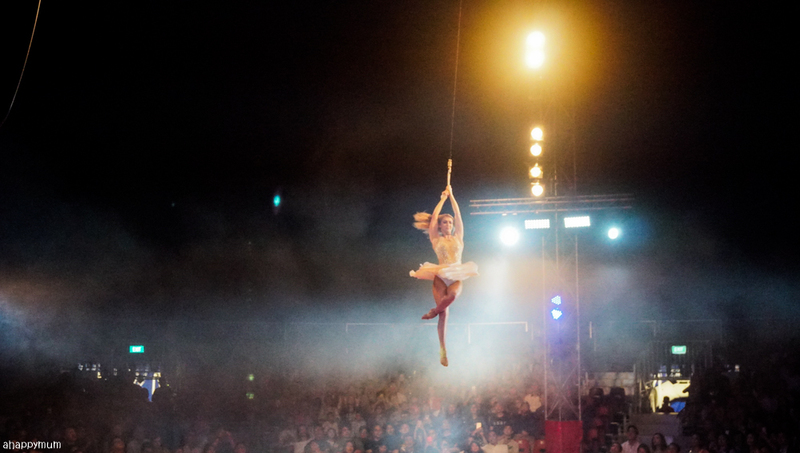 I love how The Great Moscow Circus combines traditional circus acts like juggling, skipping and balancing with new ones like the death defying Wheel of Death and Globe of Death (read about this at the end, it's crazy!). There are also no animal acts so all you see are remarkable, outstanding and totally incredible humans who seem to have redefined our limits in every possible way. It is also commendable that despite the fact that technology has advanced, they still keep up the tradition of using live music during the show with the help of basic musical instruments. Nothing fanciful, yet every bit charming and appealing to the senses. 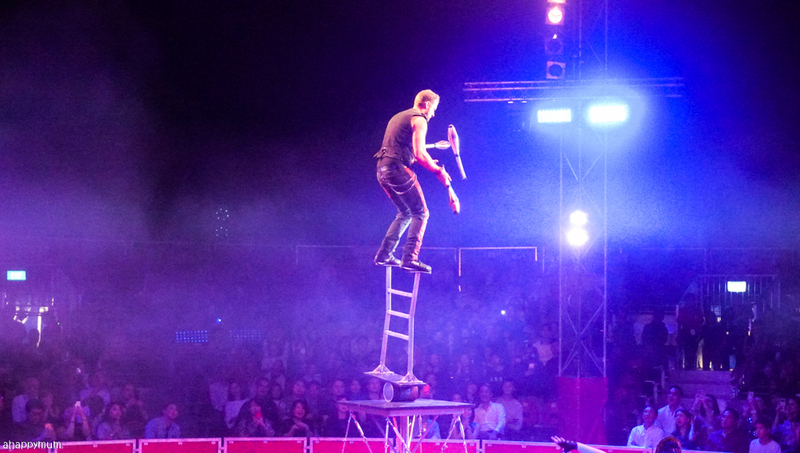 The first act of the second half was the balancing and juggling act, and I was quite surprised when Ariel told me that this was her favourite of all because it didn't exactly have that mind-blowing or jaw-dropping effect like some of the other dangerous stunts we saw earlier. This was a reminder to me that traditional acts have their appeals to the younger generation too and no matter how advanced technology gets or how our skills get upgraded, we must always hold onto our roots and be thankful for them. 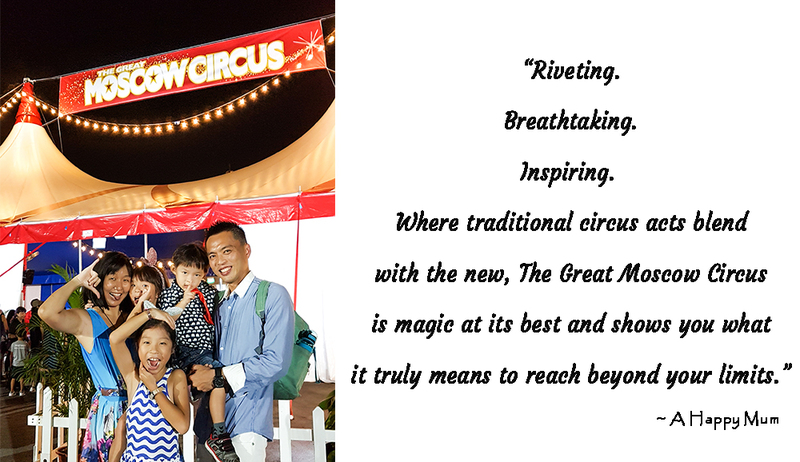 When ringmaster Stas asked the audience if anyone was watching a circus for the very first time, I wasn't expecting it to evolve to something that would touch my heart and make me feel fuzzy all of a sudden. You see, he went on to say that circus are said to be like the skies while the circus performers are the twinkling lights, before he went on to clarify that actually, the stars are us - the audience - who help to light up the night sky and be able to shine brightly in our own ways. 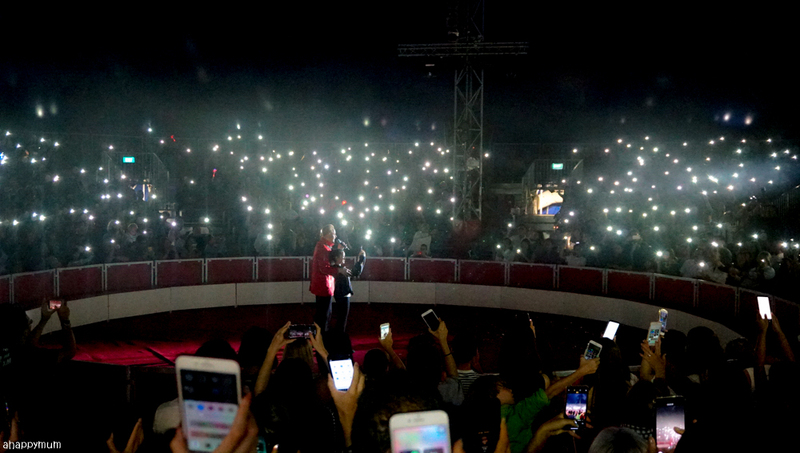 He invited a young girl who was watching a circus for the first time to join him on stage and after that, he requested for everyone of us in the audience to take out our mobile phones or any electronic gadgets and turn on the flashlight.... together. This was how it looked like. Yup, we created a night sky with glistening stars and transformed ourselves to another universe for that few minutes. It was a simple gesture but those words he said were sincere and heartfelt, which made everything feel so magical and truly wonderful. At least, it felt so for me. 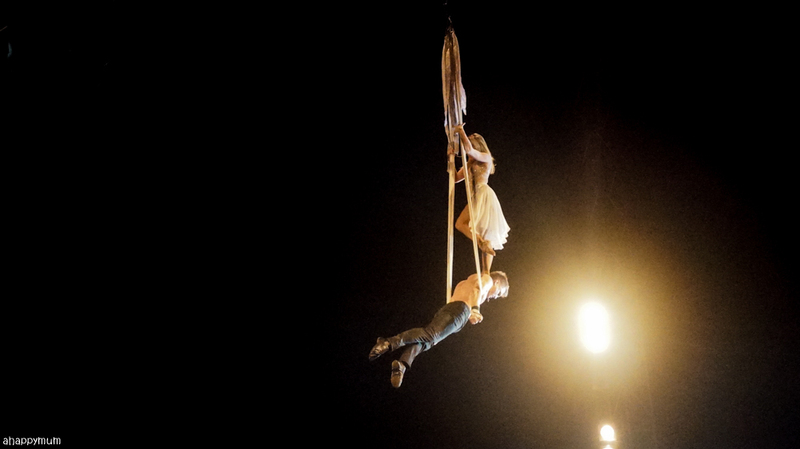 Back to the action, next up, we had the aerial acrobatic duo! 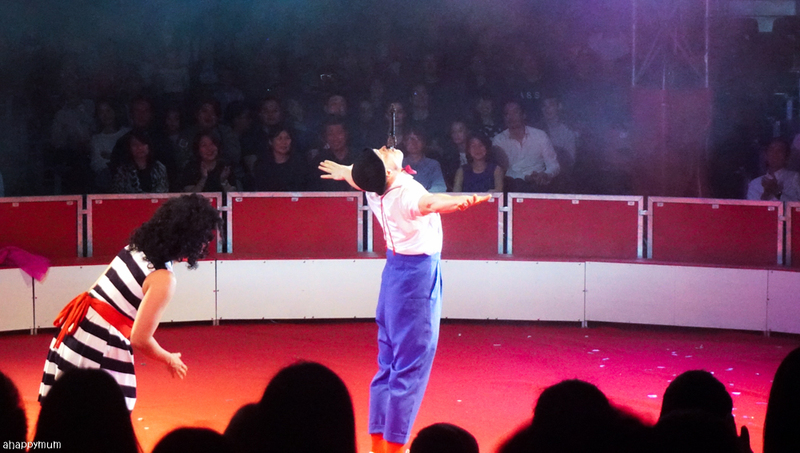 This was Angel's favourite act of all because it is a combination of dance and circus and their movements were so graceful and impressive at the same time. The most amazing, and a tad worrying, thing was that there were NO safety nets, wires or mattresses whatsoever. Yes, how can it be, right? The two of them were lifted high up, they turned upside down, they did countless spins and they were basically flying round and round the stage in the most beautiful way. 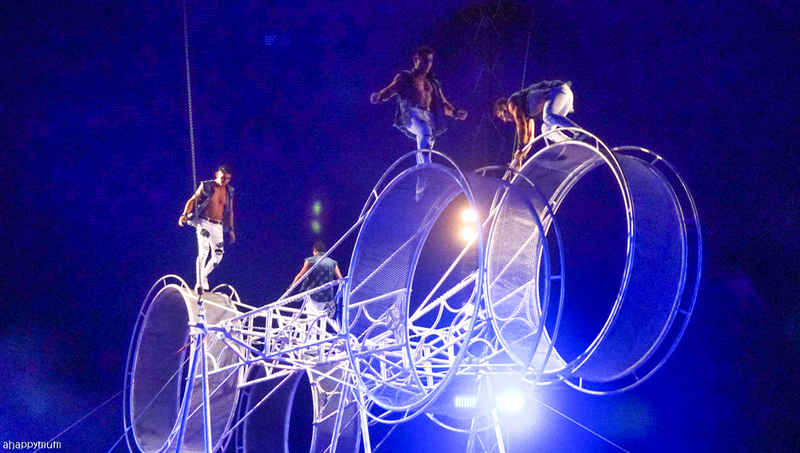 This was one of the acts where you would get a good view of the action even if you were seated at the side or at the back because the performers were lifted up in the air and they made full use of the round stage. I totally enjoyed this act too, wouldn't you? Now, a circus wouldn't be a circus without clowns, right? We are not looking for the clowns which have big, colourful wigs, red noses, oversized costumes and heavy makeup but more of clowns which are able to get our attention, make us laugh, lift the mood, and entertain people of all ages with their antics. 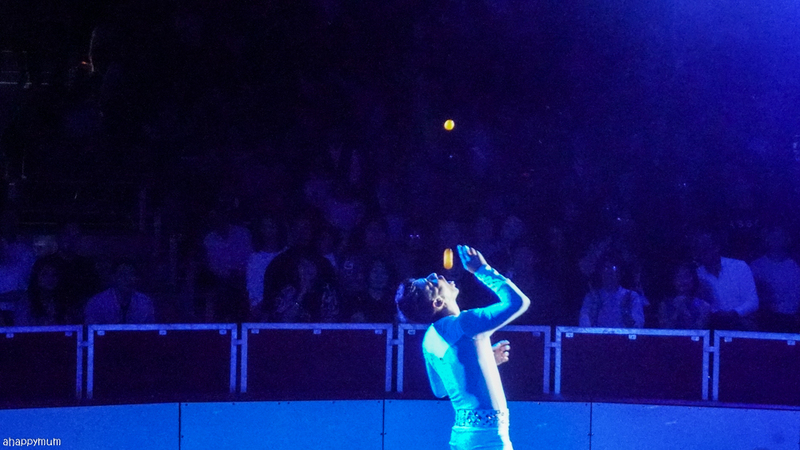 The clowns we had at The Great Moscow Circus were the best I've encountered and they were really funny too! From the way they did hilarious tricks, how they played pranks on Stas, how they tried to make each other wet and even came dashing into the audience while shooting their water guns, how they interacted with the audience, the mood was kept light-hearted every time they appeared and you actually look forward to them coming out in between the acts. 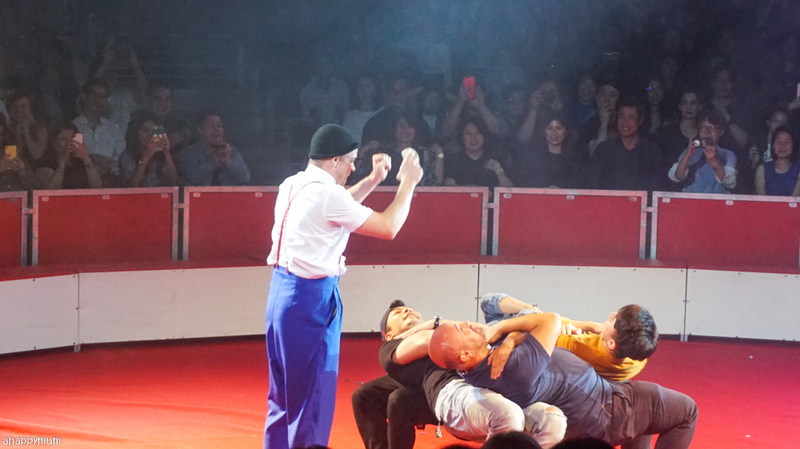 One of my favourite parts was when one of the clowns picked four burly men from the audience to go up to the stage with him. He then made them imitate him by doing wacky dance moves, followed by a handstand and even a back flip! 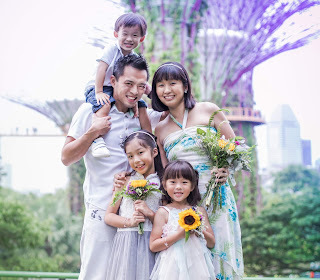 I have to say they gamely tried and put in their best effort, and it was so nice to this spontaneous side of Singaporeans. My kids couldn't stop laughing too because everything was so real, so unrehearsed and so funny! The best part was when he directed them to do the 4-man chair trick and they actually did it - and managed to hold on for quite some time! Awesome job, guys! 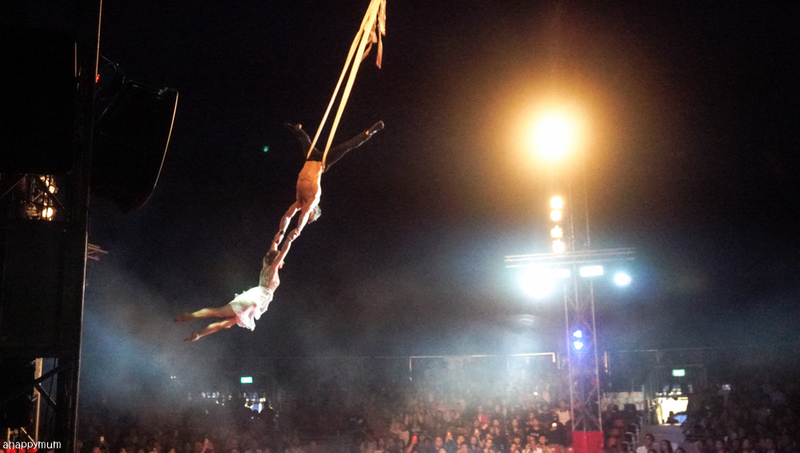 As with all circus shows, there is always a risk of injury and a chance of mistakes being made in every act. That is what makes your heart pound with the circus stars as you worry for them and hope they can achieve what they set out to do, right? I think what makes them even stronger is when they pick themselves up after a fall, and you witness the true meaning of grit, tenacity and a determination to get to the end. True enough, it wasn't all perfect and we did see some of the circus stars stumble or lose their footing, especially during the high difficulty acts. That said, this was what made everything more real to us and you actually admire them even more because they proved to us that they are humans after all, yet they can achieve feats that we never imagined would be possible. 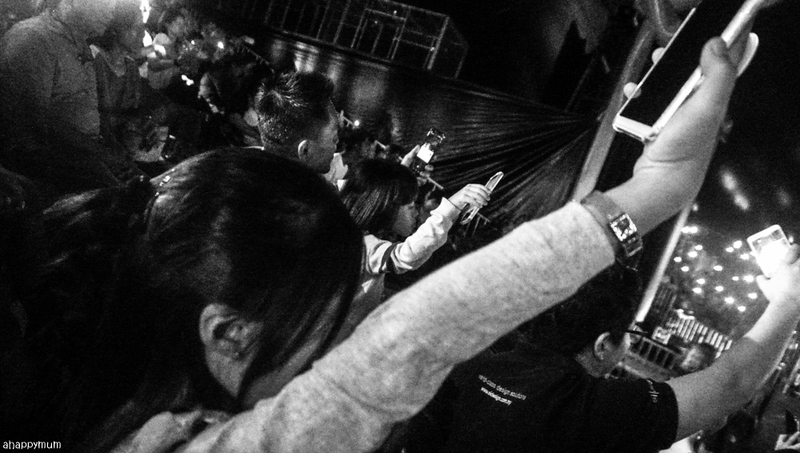 So yes, our applause got even louder when we knew they needed our encouragement and it was quite a heartwarming feeling seeing how everyone in the audience would cheer them on. 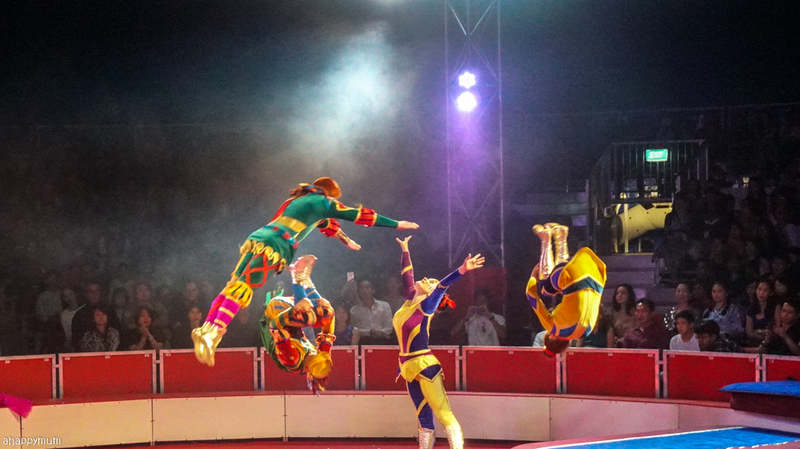 Circus superstars, please know that we salute you for what you do and we appreciate all the hard work you've put in! Another act that we really enjoyed was the one by the Mexican with the sleek dance moves, who could amazingly juggle pins with his hands, ping pong balls with his mouth and he even used straw hats and somehow made them behave like boomerangs which would return to him every time he tossed them into the air. Honestly, it was all very fun and enjoyable to watch and my kids were very impressed by him too! For the finale act, it was something that we've never seen before nor thought it would be possible too. 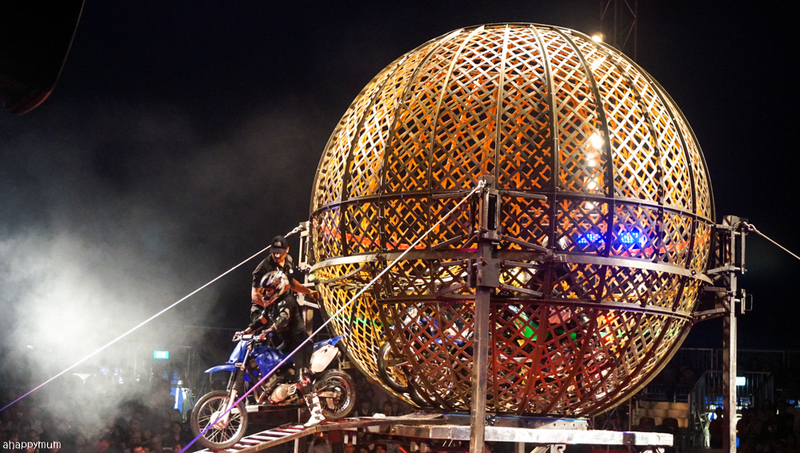 See this huge globe made of tonnes of steel below? It was daunting to even get it up on stage and set it up properly. Everyone was anticipating what this final act would be and I could almost hear silence because we were all holding our breaths. 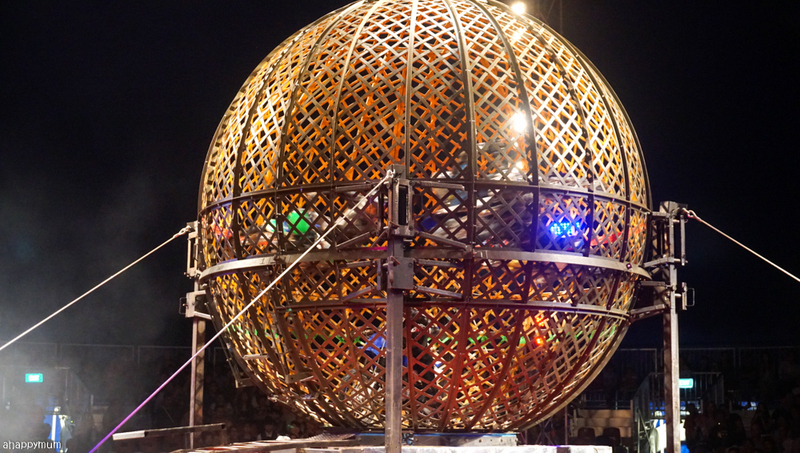 This was called the Globe of Death and it was performed for the first time ever in Singapore. See who was about to enter the globe? Yup, a motorcyclist! I mean, seriously, how death-defying and terrifying is this stunt! Then it increased to three motorcyclists, making everyone in the audience gasp. As if that was not enough, it then became FOUR! And you know what? The last motorcyclist was a SHE! Yup, I was really impressed by this lady who seemed to be fearless and displayed skills which were on par with her male counterparts. You rock, girl! Here's a look at how it all went, this was definitely the climax of the show and a perfect way to end it. You know, I can go on to talk more about the show and relate all my experiences to you, but nothing ever beats being there to see everything for yourself. We were so thankful to be there to witness all the astounding acts and to be frank, I don't even mind bringing the kids there to watch it again because I think we will still enjoy ourselves and have a good time. 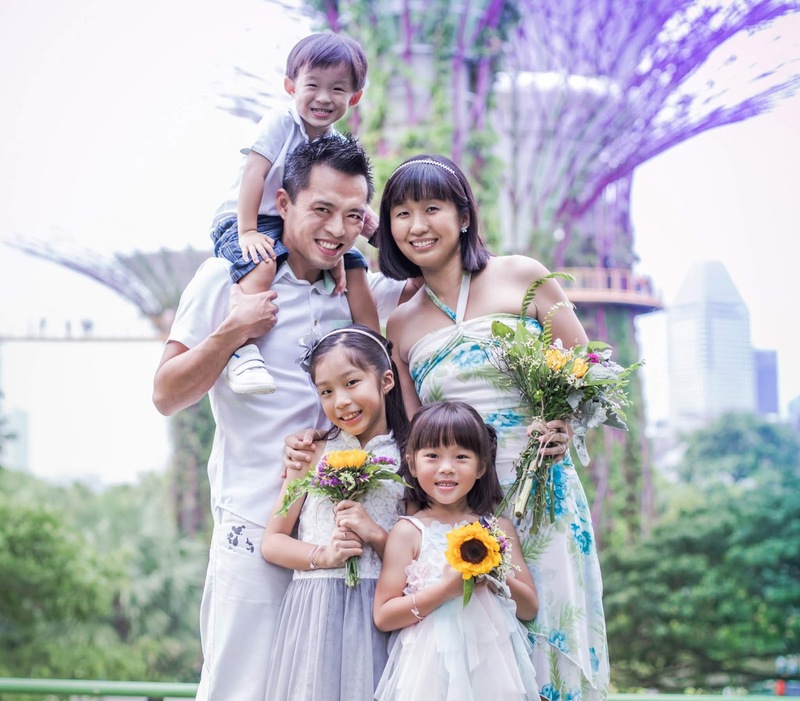 So if you are looking for some family fun, kid-friendly entertainment, exciting thrills or wish to do something different for a change, don't hesitate to book your tickets for this circus of a lifetime because tickets are selling fast. I'm pretty sure the kids will have a blast and thank you for it, and it will be a spectacular night for the whole family to remember. I sure hope you'll enjoy it as much as we did! To book your tickets, go to SISTIC. 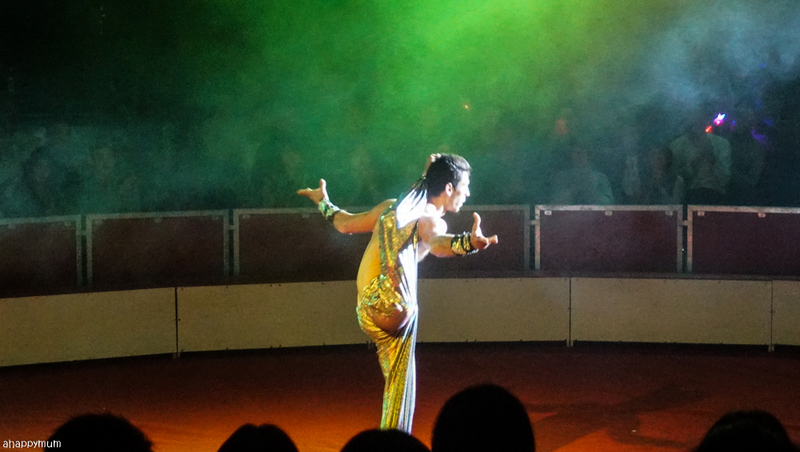 For more event information, visit http://www.great-moscow-circus.com/. Check out their official video below too. 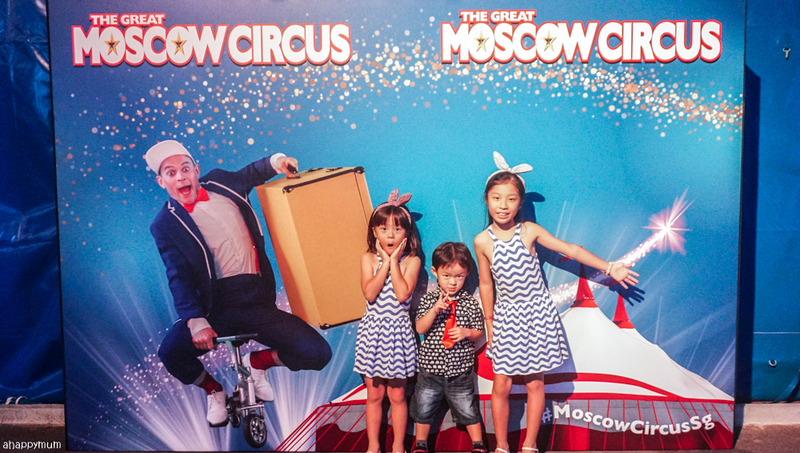 Disclosure: We received a media invite from Sliding Doors Entertainment to attend the gala premiere of The Great Moscow Circus. All photos and opinions are our own.